Donald Trump’s N.H. poll results: The Donald’s second-place showing might not be enough to get him on the debate stage. 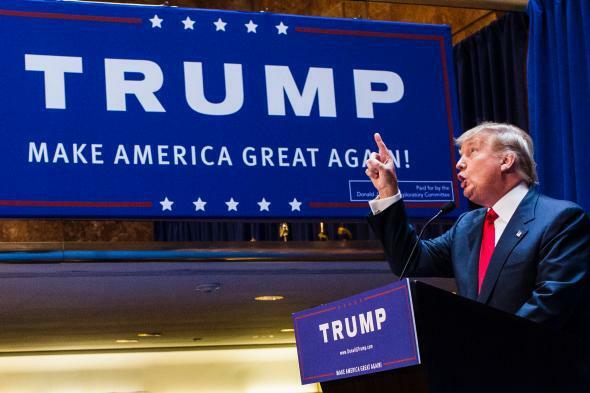 Trump Places Second in New Hampshire Poll. Don’t Freak Out. Donald Trump announces his candidacy for the U.S. presidency at Trump Tower on June 16, 2015, in New York City. Photo by Christopher Gregory/Getty Images. Ugh. Donald Trump placed second among the crowded GOP field of presidential hopefuls in a new poll of New Hampshire Republicans that was released Tuesday. The Donald was the first choice of 11 percent of those surveyed, 3 points behind Jeb Bush and 3 points ahead of Scott Walker in the Suffolk University poll. The reality star’s performance is already generating some Trump-themed headlines, but the truth is that his polling numbers aren’t actually that much of a departure from his recent showings in the Granite State. In the previous three GOP surveys there, he finished tied for fourth place with 8 percent (Morning Consult), in fourth alone with 12 percent (Gravis Marketing), and in fifth with 8 percent (Bloomberg). In the RealClearPolitics rolling average in the state, meanwhile, Trump is sitting at 8.8 percent, good for fifth overall and within 2 points of Scott Walker for second. Trump isn’t surging so much as he’s hanging around toward the front of a field where a point or two either way can mean the difference between second and sixth. The new survey confirms something else we already knew about Trump: His specific slice of supporters aside, he’s the most disliked candidate in the entire race. He was the only one of the GOP candidates in the Suffolk poll with a net-unfavorable rating: Thirty-seven percent of those surveyed had a favorable opinion of him, compared with 49 percent who felt the opposite. For comparison: Marco Rubio posted the best score, 61 percent favorable to 14 percent unfavorable. But despite his many detractors, Trump clearly has his fans in New Hampshire. In addition to the 11 percent of respondents who named him as their first choice, 7 percent listed him as their No. 2 pick, which trailed only the GOP’s big three—Bush, Walker, and Rubio—in that category. That the state is keeping Trump’s ego inflated is fitting: His three-decade-long presidential tease began in 1988 when a local GOP official there launched a “Draft Trump” campaign, which gave Trump his first taste of the free PR that can be generated by a political head fake or two. The irony in all this is while Trump continues to poll well in New Hampshire—something that in past election cycles could have been mistaken for a sign of political legitimacy—his national support seems to be petering out. In a new Wall Street Journal/NBC poll out Tuesday, he garnered only 1 percent support, which put him in a tie for 11th—the second consecutive poll in which he placed outside the all-important top 10. Fox News will use an average of the five most recent national polls to set the field, so if the network were to send out its debate invites today, Trump would still get the final one—but his downward trend suggests he’s now in serious danger of missing out come August. That would be just fine with most GOP voters, even those in New Hampshire. When the Suffolk pollsters asked whether or not each candidate should get to take part in the debates, 10 other candidates were chosen ahead of Trump, a reminder that many of those voters who don’t like Trump really don’t like Trump.